3M Cavilon Extra Dry Skin Cream is a moisturizing cream ideal for individuals with diabetes or other dry skin conditions. The pH balanced, lipid-rich formula lasts 24 hours to soften and relieve rough, cracked, or scaly skin. Cavilon Extra Dry Skin Cream was formerly known as 3M Cavilon Foot and Dry Skin Cream. It is ideal for use with diabetic foot care. It is hypoallergenic, pH balanced, and latex free. The lipid-rich formula softens and replenishes rough, cracked or dry skin. The non-greasy cream is silky and rubs in and vanishes into skin easily. It moisturizes dry, cracked or scaly skin, especially on feet and legs. 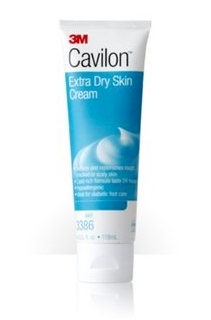 Apply 3M Cavilon Extra Dry Skin Cream liberally as needed and massage into skin. Water, Glycine Soja (Soybean) Oil, Glycerin, Emulsifying Wax NF, Glyceryl Stearate, Dimethicone, PEG-40 Stearate, Zea Mays (Corn) Oil, Avena Sativa (Oat) Kernal Extract, Ascorbyl Palminate, Tocopheryl Acetate, Panthenol, Propylene Glycol, Butylene Glycol, Tetrasodium EDTA, PEGF-8, Citric Acid, Methaylparaben, Fragrance, Diazolidnyl Urea, Propylparaben.